@Dawn Bronze, thanks for the feedback. Yeah, Apricorns are good replacement for Pokeballs, but there's no explanation why such monster could be digitalized and absorbed into them. There is no explanation either for why didn't the Apricorns industrialized and Pokeball is invented instead. It'd be great to see a game which elaborate this. As for PC Storage, having ranch is nice too with each ranch have a unique theme aesthetically making a visit to the 'pokemon center' a more interesting experience. I actually prefer your second idea about move tutor. We could even use this as a goal: to become a master move tutor where we have to learn from the existing move tutor, exploring prehistoric ruins to learn ancient move, or any other task. There is even a competition for each move tutor to demonstrate their ability in pokemon battle. It'd be great if the player could create their own signature moves once they reached a certain level--a replacement for badge system. The player start from a novice (or level 1) and the more the player master a move, the more level the player will get. Same things could be applied to the Pokedex, where the player is a researcher dedicated to record all Pokemon species so when new Pokemon is caught, the player draws the Pokemon forms in his/her book and gives its entry and even name the Pokemon itself, making the Pokedex more customisable. This way, the player acts like Carolus Linnaeus in some way. If anyone is interested in developing this idea, feel free to tell me as I'd really like to help (since I don't have RPG Maker XP ^^") Any idea is open for how the Pokemon world works in the past. 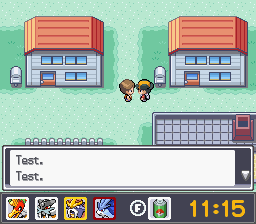 I've been playing with the idea of a small part of the screen being dedicated to some additional information, such as Pokémon status, etc (image 1), while also doubling up as an extended command screen during battles (image 2) or just additional room in the screen (summary, party, options screens being a little longer, and that's it). Don't mind ugly color choices and such - I'm here for discussing usability, and I could use a few answers before I decide to invest more time on this! The reason behind 4 Pokémon is this is just meant to be a short game with focus on Double Battles (and 4 Pokémon), so I could dedicate more space to showing those 'faces' instead of just the party icons, don't mind that either! - (Image 1) Does a clock feel useful? At the moment I have no plans of using the Unreal Time Engine and after all if you want to check the time you can just use your computer's bottom right corner but I thought it'd look pretty! - Should I use that space instead of more item shortcuts, or other shortcuts such as a key-bound Save or Bag button? Any other ideas? I'm out of them! - Do the colored borders give you an idea of a Pokémon's status problems (yellow for paralysis, red for fainted etc) or should I use pictures? Ideally, if it were to support mouse, clicking the small portraits would take you to the Pokémon's summary window. - (Image 2) Is it easy to tell what color belongs to which command? Here's a second version I don't like as much, but that would be clearer to tell which command you've hovering over. 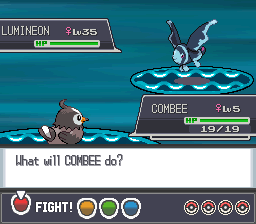 Yes, it's named COMBEE. I manually changed it's species at some point. I'm open to any kind of ideas of other uses you could come up with and feedback! @Phi-Bi: Before Poké Balls and primitive Poké Balls, I assume people just befriended their Pokémon. If you don't want to re-imagine the entire battle mechanics, how about throwing Bait? What about having your active Pokémon "talk" and convince the wild Pokémon of joining you? That would be refreshing. Clock: Aesthetically nice, but I don't really see the point unless the game uses unreal time or has a significant amount of time based events. (Heavy focus on wild pokemon availability changing throughout the day/night cycles?) That said, is there still enough room for the clock when a party of 6 is displayed? I think registered items is a pretty good thing to have displayed. I can see it being useful for keeping track of multiple key items that are registered, or letting the player map some items from the main pocket (Like Repel or their medicine of choice) would be neat too. If I was gonna guess based on just looking at this screen what the colored boarders were, I'd say the amount of HP they have left; Suicune needs healing! It's probably more intuitive when actively playing though. Oh, you know what'd be hecka cool? If the player could quickly re-arrange their party from there instead of opening up the party screen. Eh, I'm not so hot on this. Maybe if the buttons at least had some symbols/icons on them so the player could tell what all their options are. Also as a note: I hope that hitting left will go from the red button to the blue one, instead of having to go 3 clicks to the right. Hey, is there a general place to put discussion for new types? I have some things I want to talk about, but with the new Relic Castle setup I'm not sure where to post. Would talking about it here be good, or is there a place where I can start a thread? This is the place to discuss new features, concepts, and stories for fan-games, so I imagine that this is indeed the place if you're wanting to get feedback on types you're wanting to add into your game. However, if you're wanting to start a discussion about the pros and cons of new types, then I think maybe try in the Fan-Game Discussion area. For players that play in both day and night hours, it could encourage alternating between a Light and Dark type rather than keeping one ace at the front. Could give me a reason to include trainers that only show up at night/in the day, to give people a reason to revisit places. Easily exploitable-if you’re not happy with the current boost, just change your clock. Does this sound like an idea worth pursuing? Or should I try for something else? In any case, yours certainly did break the mold in a very notable way - you completely rethought the Dark type to make way for it, which is already the main problem I usually have with Light ("but Dark isn't meant that way"/"Fighting is Dark's counterpart; it doesn't need another," et cetera, which you actually did address), and I can't think of any other time someone has done that. If it's any consolation, yours actually is different from the cliche and does escape the problems that plague everyone else's Light types, so props for that! Regarding your idea of time-based modifiers... that's actually awesome!! O: It works really well with your new focus on Light and Dark duality (between your Legendaries being pure Light and pure Dark and your having basically made Dark a new type in itself with the intention of cultivating that parallelism!) and time is a mechanic that I rarely see given any sort of focus or effect outside of encounters and aesthetic differences. The only way I can see this being a problem is if your game has multiplayer, because players might have different times, and unless you're really careful about how you implement that, I think that might risk desynchronizing the battle/breaking the connection. But most games don't even have multiplayer, so that's probably not something you have to worry about! I just thought I'd bring that up since I don't think any existing multiplayer system is built to account for time-based battle mechanics (there aren't any in canon at the moment, since Morning Sun/Synthesis/Moonlight were changed to depend on weather a while back). But multiplayer aside - and that's a very rare problem, so I'm sure it's safe to say you'll cross that bridge when you get to it! XP - I really like the idea of boosting Light- and Dark-type moves based on the time of day! It's strange to me that a feature that's been so consistently a part of the series (in five of the seven Generations!) and was even the focus of the most recent pair of games is nearly always purely aesthetic, so it's really cool that you're giving it a purpose and using it to expand on a new type! There are a few tutorials out there for an unreal time system as well (this one was last edited this recent January, so I'm guessing it's up-to-date with the latest Essentials, though I haven't tried it yet), so if you're considering that for the purposes of balancing this, I would say to go ahead! Players are used to time of day being purely aesthetic, so I don't think it would come off as intrusive, and I've never seen anyone take issue with a fangame using it; it seems like it would only serve to benefit the game in this case, not detract from it at all! Sound >> Fighting: A martial artist can't stand up to a supersonic blast. Sound >> Psychic: Try keeping your head on straight when your mind is being assaulted by loud noises. Sound >> Fairy: Actually keeping with the pollution weakness theme in the form of noise pollution, a real and little-known form. Sound > Bug: Bug needs a resistance. That and bugs are durable as hell, so what's sound gonna do to them? They're already noisy. Sound > Ice: Notice how it's awfully quiet in winter? Snow tends to absorb sound. Yes, I know an argument can be made for literal ice. Flying >> Sound: While a sound cannon can, in theory, take out a bird, this is mostly a matter of air being the medium through which sound travels through slowest. Bug >> Sound: Cicadas. Just... cicadas. Electric >> Sound: I like to think of it as shorting out a speaker. Also a matter of balancing, since Sound is very offensively powerful and Electric is only strong against two types. Fighting > Sound: Try punching ammo from a sound cannon. Your hand will shatter. Ghost > Sound: I've heard of the term "scream like a banshee," but this is ridiculous. In truth, do you expect a ghost to be disturbed at all if you scream at it? Psychic > Sound: Mind-bending will only create screams in your head. In the physical world, it ain't gonna help. Sound - Sound: Soundproof as an ability, for starters. The antithesis of Dragon and Ghost, lowering Sound's high offensive power and bumping up its rather low defensive power. One of the balancing aspects of this type as well was the fact that few Pokemon received it, and most of them were quite slow and generally not seen in competitive play, such as Exploud (pure-Sound) and Wigglytuff (Sound/Fairy). Of particular note would be the rarely-if-ever used Chimecho (Psychic/Sound) and Kricketune (Bug/Sound). This is FAR from perfect, but I figured as someone who's spent a fair bit of time playing Pokemon competitively that it'd be worth sharing. It went through a couple of stages before reaching this; sound is tough to weasel in. As @Darius_Oak has posted their old version of a Sound-type chart, I feel it would be fair to post my type chart to here for discussion. Now fair warning, some changes will not be truly logical, but they were done for the sake of either nerfing a specific set-up or dual-types. In addition, the decisions that led to this version of the type chart were majorly influenced by the planned battle mechanics of my project, and really shouldn't be blindly applied to a simple Pokemon game. Lastly, this type chart does utilize various re-changes between official types, and my project will thus provide many guides and effects to help the player become accustomed to the changes. Fire-types no longer resist Bug and Fairy, but now resist Ghost. Water-types are now weak to Poison, but now resist Ground. Grass-types are no longer weak to Flying, and now resist Dark and Fairy. Ice-types now resist Electric, Flying, and Bug. Fighting-types now resist Grass and Ice, but no longer resist Bug. Poison-types now resist Water and Steel, but no longer resist Bug. Ground-types no longer resist Poison, but now resist Bug and Steel. Bug-types no longer resist Grass, but now resist Poison, Psychic, and Dark. Rock-types now resist Electric, Ice, Bug, and Dragon, but no longer resist Poison. Ghost-types now resist Ice and Ground, but no longer resist Bug. Steel types are now weak to Electric, and no longer resist Ice. a. Sound-types are super-effective to Normal, Electric, Poison, Ghost, and Fairy. b. Sound-types are resisted by Grass, Ice, Ground, Flying, Psychic, and Mystery. c. Sound-types are weak to Ice, Flying, Psychic, and Steel. d. Sound-types resist Fire, Fighting, Poison, Ghost, and Dragon. e. Sound-types are immune to Sound. a. Mystery-types are super-effective to Mystery. b. Mystery-types are resisted by Psychic and Dark. c. Mystery-types are weak to Normal, Grass, Bug, Dark, and Mystery. d. Mystery-types resist Fire, Water, Ice, Poison, Ground, Flying, Rock, Steel, Fairy, and Sound. e. Mystery-types are blocked by Normal. The only things that are still open to change is the interactions between Grass, Flying, Steel, and Sound, so any tips and suggestions for those types would be greatly appreciated. Aw, heck, it's totally okay! I know you didn't mean it as offensive to anyone, and I know those types are quite common in fanworks, so it's totally understandable! Thank you! I'm still holding my breath to see how the altered type chart turns out, but I think elemental light and darkness are going to be a lot of fun to work with! That's a really good point! I think if I ever did make it to multiplayer, I'd just take it out for online battles-even if the time system did line up, there's still the matter of having a fair fight when someone's team could be getting an unfair advantage from the time of day. Oh, good point! I'll probably need to keep an eye on balancing the game anyways, so it's good to know it'll take care of that as well! Ooh, I like the idea of fixed times for those encounters! It'd be a fun way to emphasize their powers! That looks like a great resource, thank you so much for sharing it! I'll definitely see about using it, then! Don't worry about it! I've seen enough of your posts to know you're a very kind person-I'd be very shocked to see something actually rude from you! Thank you so much for your feedback! I feel it would be fair to post my type chart to here for discussion. Personally, and I'm not trying to be rude, I think that's too much change. I've never really been a fan of new types (especially the Sound Type - I don't get what's so cool about it), and it's pretty much for this exact reason. You're making the player re-learn a lot typing match-ups just to add in two new types that are only questionably necessary. I don't think it's necessary to make all those changes. Players will get confused and frustrated since they've already learnt the type chart. I know I'd be. Re: the above, I think that if you want to make new types, it's absolutely your prerogative to do so. BUT! If you decide to do that, make sure you've done your research to keep it fun exciting and worth putting in your game, and most importantly, make sure the player is aware of the changes to the type chart. If you need NPCs to explain, or a handy type chart as a key item, or whatever, people who know pokémon get very tripped up and annoyed with chart changes. New types are hard. 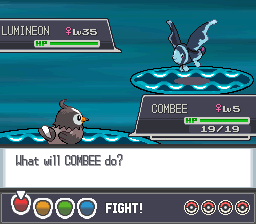 I'm willing to bet Game Freak was working on Fairy before Black and White 2 even came out, and I'm generally against including it because it introduces a whole new complexity and is extremely challenging to do right. I only worked at Sound because my project lead was absolutely insistent that I do. I think it worked out. It also certainly doesn't help that I'm the only person I know who has the entire type chart memorized. Adding a new type would just make it that much harder. As far as sound type is concerned, I'm not personally into it because it's an existing class of moves now that spans across several types, and has unique features (like bypassing substitutes). But I certainly wouldn't top someone from including it, as alongside Light and Cosmic or whatever, it's one of the most popular fan-types. You could always add Sun/Moon move effectiveness indicator if you worry people will get confused of the new type chart, but introducing key items which contain the whole type chart is nice too. Every Pokemon fan-game nowadays always revolve around the modern world and its issues. As far as I know there's no Pokemon fan-game about how the Pokemon world works before the modern time. Note that from my perspectives, the modern era in Pokemon world begins as the invention of Pokeball, followed by Pokemon Center, PC Storage, Pokedex, and so on. Now this brings question about how the Pokemon world works before all of that and how to implement that aspect in a game? While making the settings might limit the use of 'flashy' features such as all Pokemon becomes available--since some Pokemon is found recently, or things like Advanced Dex--since there's no Pokedex in the past, and any other 'futuristic' features. Even implementing the gameplay will be quite problematic since there are no PokeBall, how are you supposed to catch Pokemon. Since there are no PC Storage, how are you supposed to keep your Pokemon if you could catch it. Since there are to Technical and Hidden Machine as well, the movepool of the Pokemon is quite limited. From technical perspectives, there are many problems as well since there are little to no tiles nor clothing for the character which represents pre-modern era. I get what you are saying here. It seems like a pretty deep concept too. At the moment, I can't think of how Pokemon were stored, but my theory is that they just followed the Trainer around if they were truly dedicated. It's not great, but it's still a suggestion. I agree with you with another point, too. Legends in Pokemon games are never experienced, it would be a great idea for the next Pokemon game to go back in time and re-live that legend. Lastly, I guess we can really look at our own world to see how it evolved. Before computers existed, how did we communicate? With letters. Before then? Conversation. I guess it all comes down to the basic principle of simplifying everything down to its base and then looking how it was done then. This is a mixed fangame that may or may not be possible in reality in terms of permissions and whatnot. Iunno. But basically, it mixes two of my favorite games: Pokemon and 100% Orange Juice. The main way I'd incorporate OJ is by including characters as NPCs (I have some already prepped in my head to be gym leaders/elite 4, etc). I also might change the currency from usual to stars and such. I hope to have fakemon that relate to it too including a dice based that i designed badly and such, and make most of the town names have to do somehow with the characters that reside in them. Super Basic Story: You were supposed to be getting your first Pokemon today, but the pokemon at the lab were stolen by the mysterious creature Marie Poppo! You are tasked to chase after her. Shortly after you will find some of the pokeballs she dropped on her escape as you chase her and follow otherwise usual plots. I titled this one because the generalized story is based on an old RP using my OC's background. You play a character with an unusual ability- you can feel the pain of Pokemon as if it's your own! You were sent to live in a new region (to be figured out) with a family friend or such after you've been regularly attacked by bad groups trying to find a way to research your ability, find the source, and use it for evil. You've just moved to the region, and get to start a journey! But some of the bad people from your past are after you...And you might not quite like knowing the real reason why. I like the idea of the protagonist’s abilities-it clicks pretty nicely with the usual game formula. (gives you a reason why the protagonist would move to a new region and start a new journey, and even why they black out if they lose a battle) I can see a couple of issues with the idea, though-besides losing, the ability won’t really be noticeable for the player, which is strange, because the protagonist would likely be experiencing it a lot of the time. (and I’m a little confused on just how far it stretches-it sounds like it’s not really controlled, but wouldn’t that mean they could feel the pain of their opponent’s Pokemon as well? Why would they go into Pokemon battles, then?) The antagonist’s actions seem a little strange, too-what about empathizing with Pokemon could be used for evil? And why do they pursue the player instead of just letting whoever’s studying them now do the work for them? They could just steal the information and the player when the research is complete.